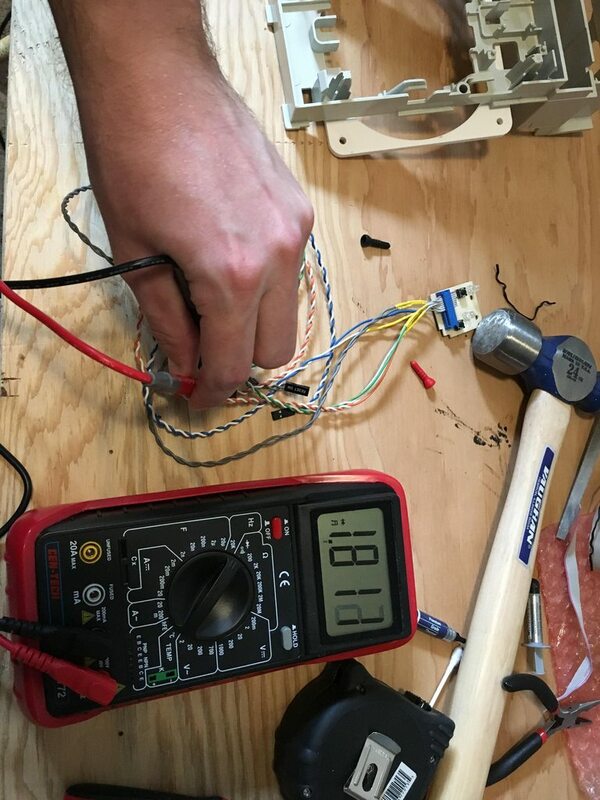 Discussion in 'Project Logs' started by Brett89, 4 Mar 2019. 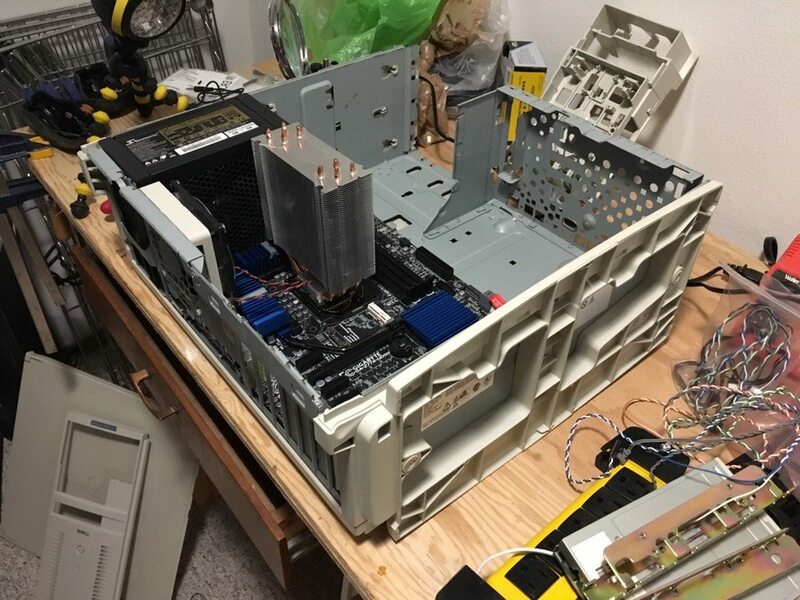 It's a collection of everything in the closet, along with a Dremel 4000, all ending up in a Dell XPS Pro200n case. 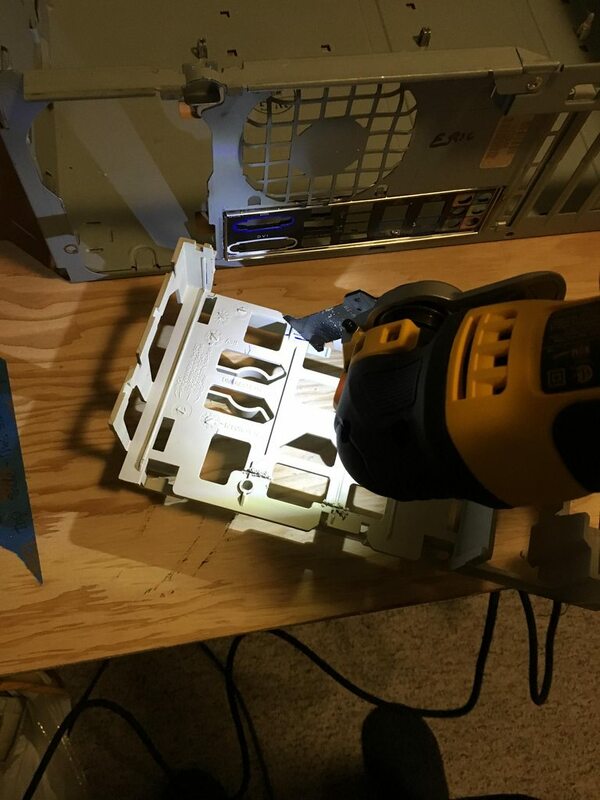 I've already got a serious computer so this is just modifying a rather old Dell case from 1997 to fit modern internals. 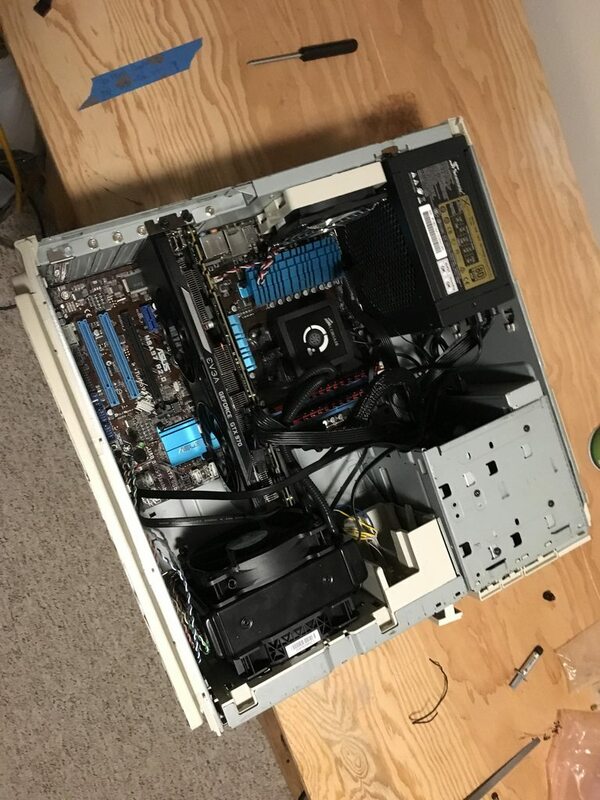 It's my first time doing this type of computer modification, and it's sponsored by crap in my closet. 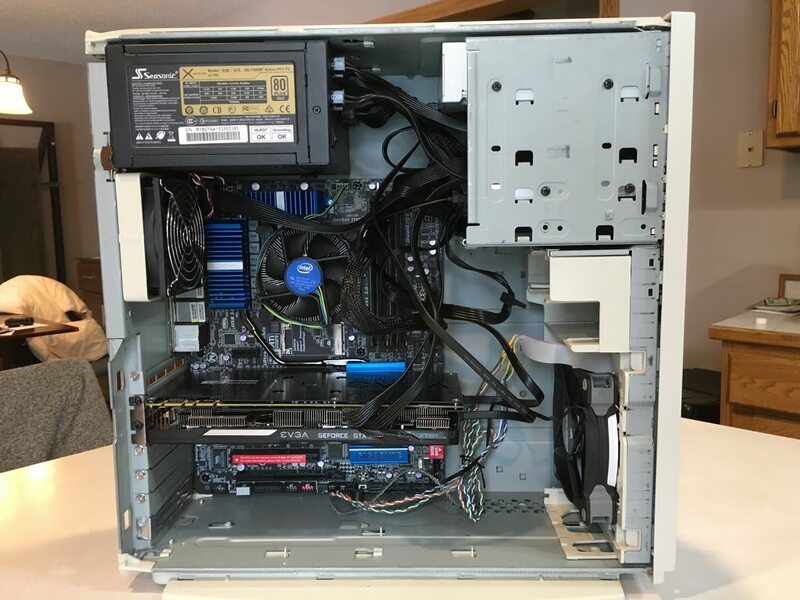 This build was inspired by a beautiful IBM Aptiva rebuild into a complete sleeper. This will not be as fancy and will be built up using parts I have laying around with as few purchased as possible. 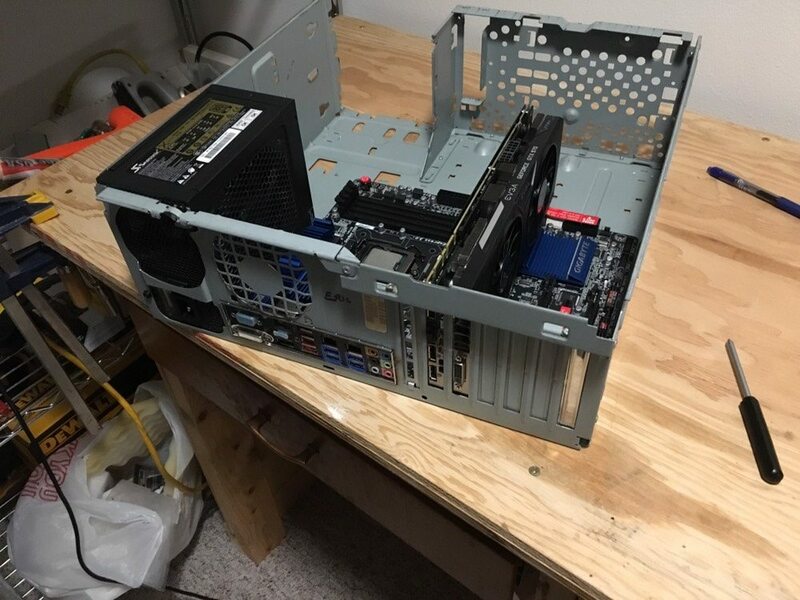 I picked this up from a former employer as empty case that once held a newer ATX form factor build. My goal with this is to make this almost-standard case into something that is standard in terms of the ATX layout with provision for a 120mm AIO. 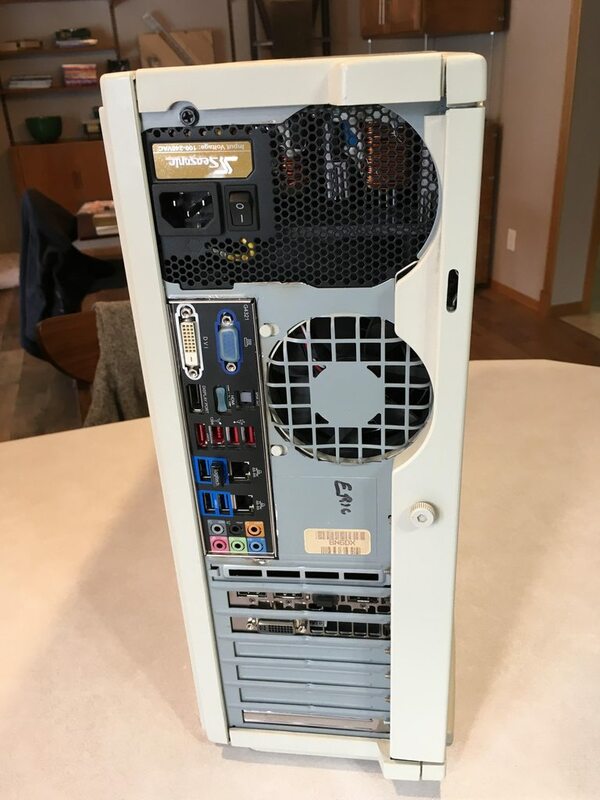 I've got a primary computer so this will be namely to find a place for my spare parts and have some fun with new experiences along the way. No idea on the cooler as my spare one won't fit (Hyper 212 Evo) I did potentially organize a trade with a friend for a stock intel HSF. I currently have no RAM. If I can find a better proc at a reasonable price I'll probably go for it. I just threw a few parts I had laying around into the case when I got it home to help visualize the impending success. The GTX 1080Ti went into my main desktop and I'll be recycling that GTX 970 Cheesecake+ to this case. I had this case sitting around at a coworkers place that does IT, so when a big clean was happening, I was told grab it or it's going. Thankfully things lined up that I had enough spare parts to make a bootable computer without cannibalising parts. 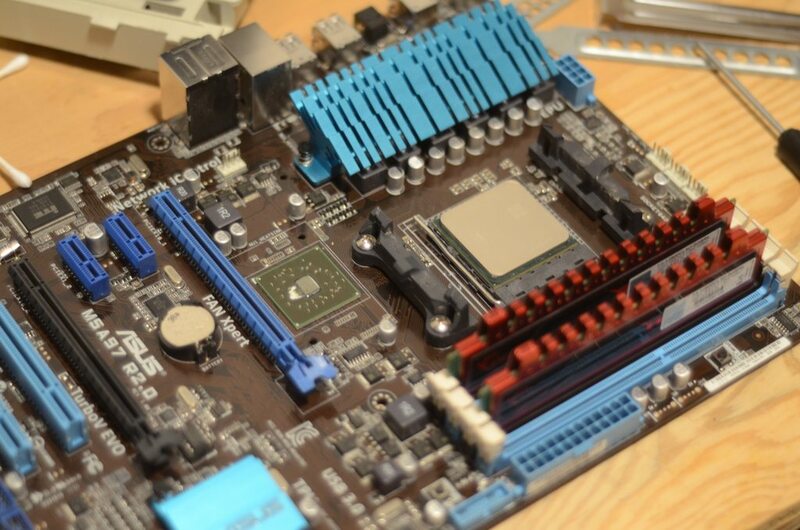 Here's relatively bare chassis, mobo standoffs are folded metal that rely on tension to stay in the backplate. Seems to have held up since 97/98, so I don't have too many reasons to complain aside from them being proprietary. So far before posting this, I've modified the front input panel, and cut the case up enough to fit a standard ATX I/O cover. So after a while spent in a pretty cool garage, warm relative to outside, I got the back panel clearanced enough, but not too much, to fit an I/O panel. AIO or not, I'd like to add a 120mm fan up front at the bottom with clearance for an AIO in the future if desired. I'll have to do some measurements as I'd like to keep the stock power button assembly intact and in-place. Later this week I should have parts to make this bootable. 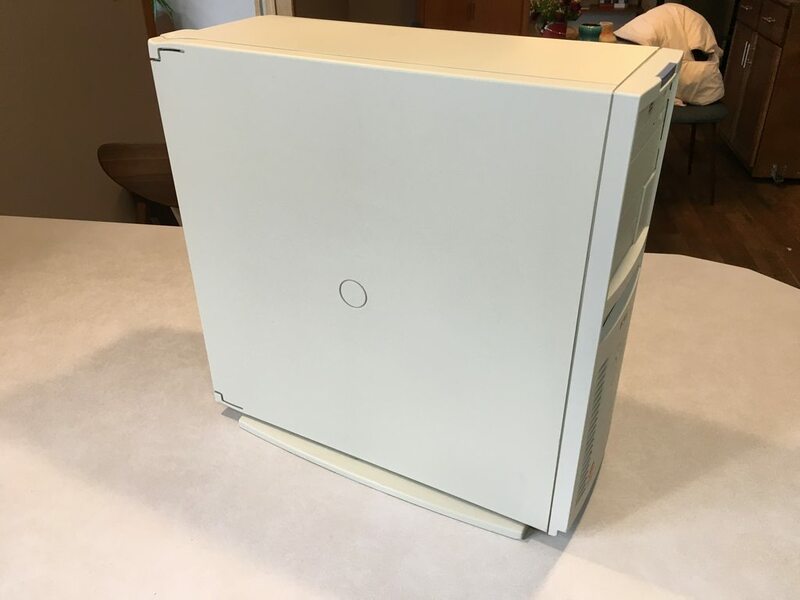 Still to do is get the floppy blanking plate in-place by some means as the color matches quite well, but it's from a different case. 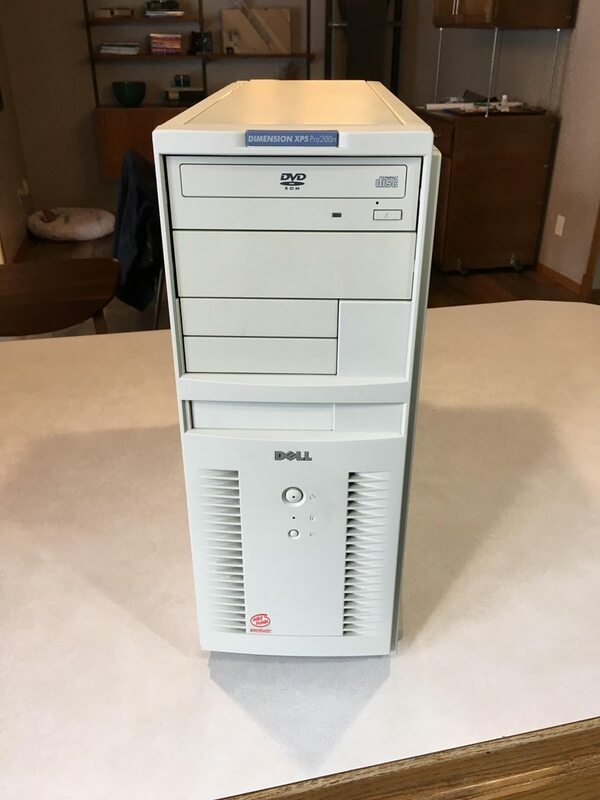 I'm looking to have some fun with this, making a standard case out of a semi-proprietary Dell, and have a project that I enjoy. I owned a few of these back in the day..... never felt they were worthy of a mod.... but now i'd kill for a clean one ! Good choice. 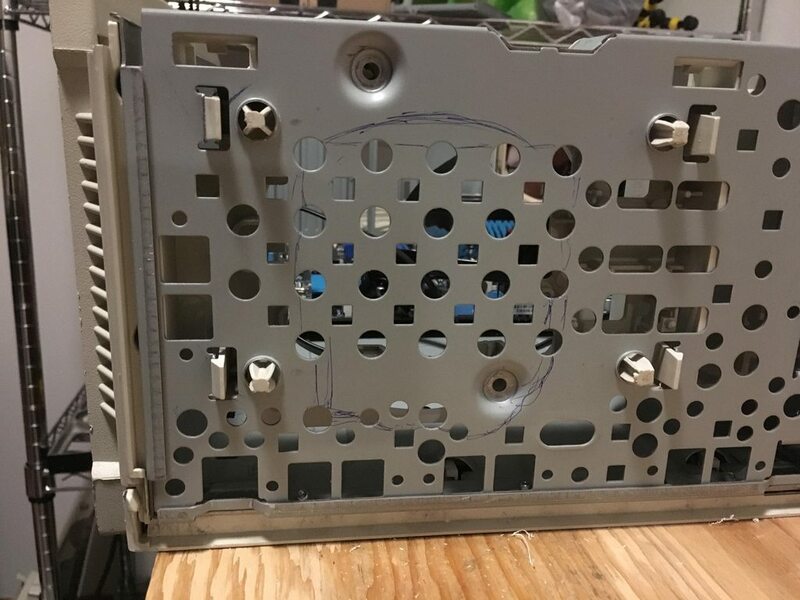 It's old enough they rounded over the sheet metal, and hadn't resorted to that horrible proprietary slot-tab motherboard mounting yet. Thanks, I was lucky to find one as I had my eye out for a while til one came up from the boneyard at work. Hot damn a Cheapskate comment! My hands will agree, it definitely is rounded-over sheet metal. Yeah it's relatively standard in terms of it's mounting which is a relief for me!. I wouldn't be doing this if it wasn't hideous, I'll say that. 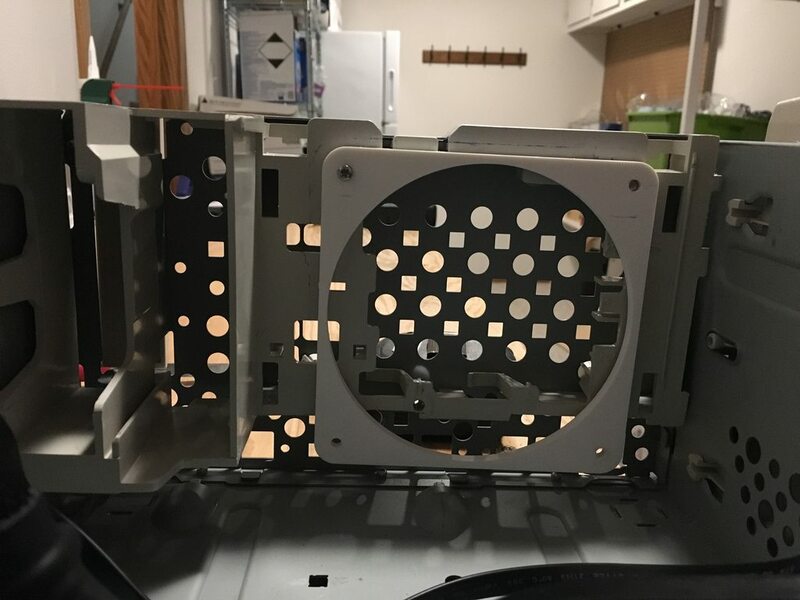 So as a recap viewers, we left off with our intrepid... person, trying to figure out the scope of work desired to mount a fan to the front with clearances... We join our person now! It turns out the front panel and this bracket intermesh against the case, to hold the font panel on. So if I'd like to keep the front panel snug and secure, I'm keeping this bracket, or at least the mounting points. In the interest of doing something rather than constantly wondering what I should do, I started cutting. So until I'd like to totally reinvent the front panel mounting, this will need to stay to some extent. 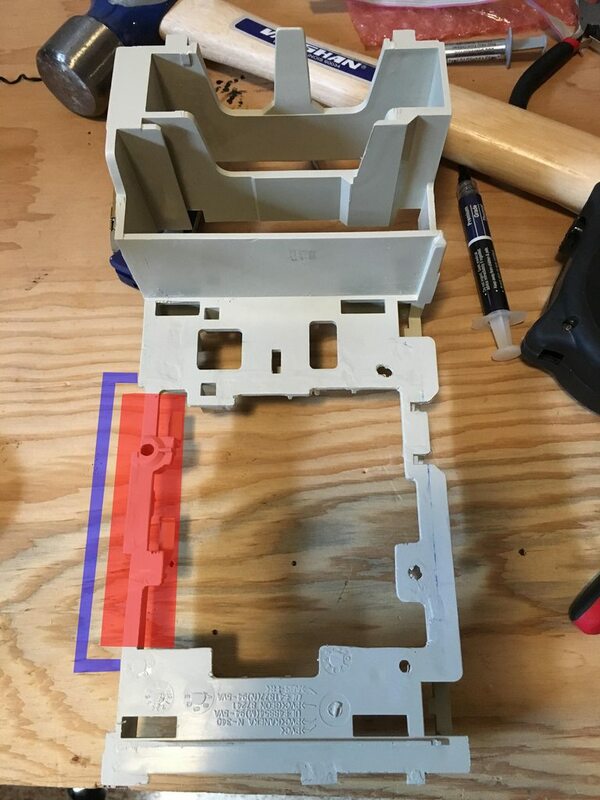 I elected to cut out the center of the interior bracket to allow for more airflow using a Dewalt oscillating saw rather than my Dremel.I definitely inhaled a lot less burning plastic fumes with this method. I was able to take off the super thin strip of plastic on the far left in one easy quick swoop. Those oscillating saws are so nice for cutting things flush. Got the fan mounted with 2 screws into the existing plastic. the other 2 are floating but it's just the fan so they're not stressed. 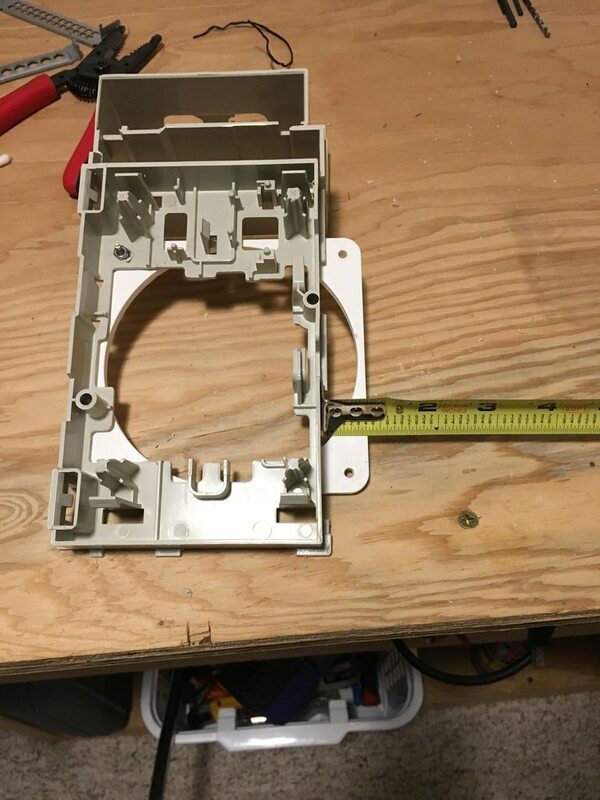 I may get a steel bracket measured up and made to connect the to floating ones with the case, but for now, it'll work. Got most of the parts mounted into the case, the mobo, PSU, graphics ,and the SSD on the SSD bracket. 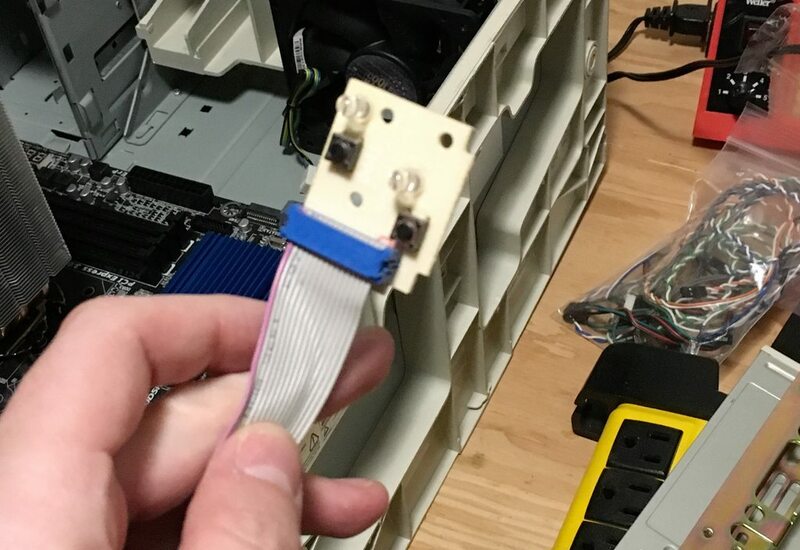 I really enjoyed that I can still retrofit a SSD to a computer case that's 22 years old. This part works brilliantly at this point in my opinion. 1. get a nicer solid mounting for the front fan and an 120mm AIO onto it. Ideally right against the metal for clean fresh air, but there's a few things vying for space there. 2. 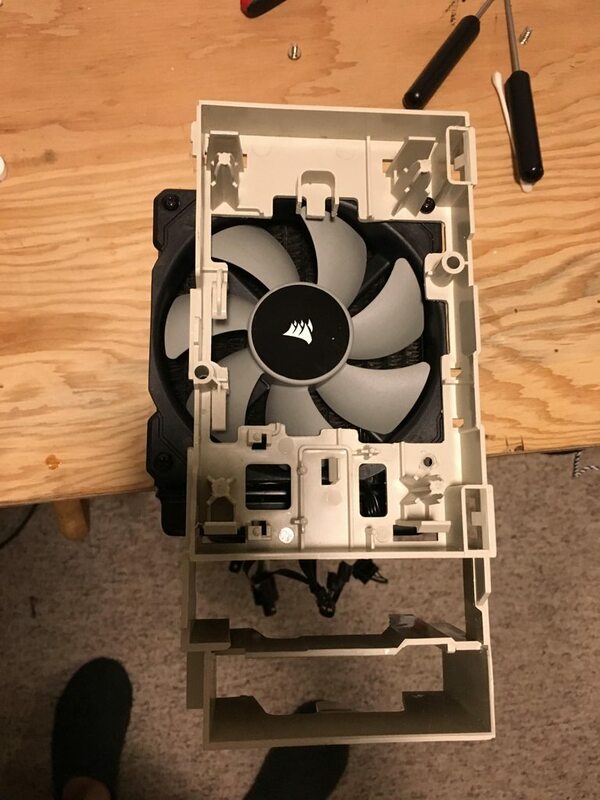 Get a 80mm fan for the back, the 92mm on there currently fits, but I'd be screwing through the I/O panel and the flange of the metal to make it fit. I think the grill is pretty structural at this point so I dont want to just cut holes in it. 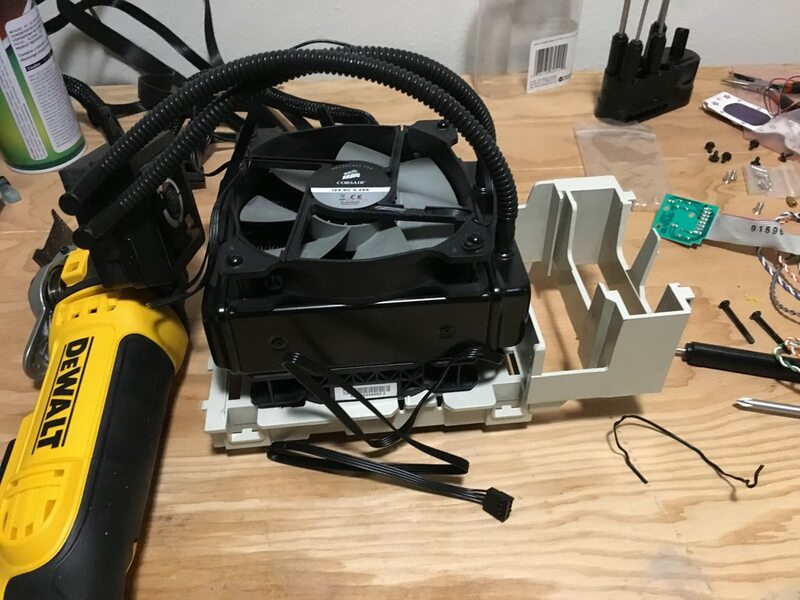 I can set the PSU fan to be ON rather than if needed, so that will help with airflow. 3. Figure out a nice way to get some more standoffs. I may just try to get some hardware to hold a normal standoff behind the board with a nut. We'll see what custom length standoffs I can find or an alternative. I'm missing the 3 along the closest edge to the board and surprisingly (not) ebay doesn't have parts. Hopefully later this week I'll be able to get the few parts I need to get it booting and see what I can do. 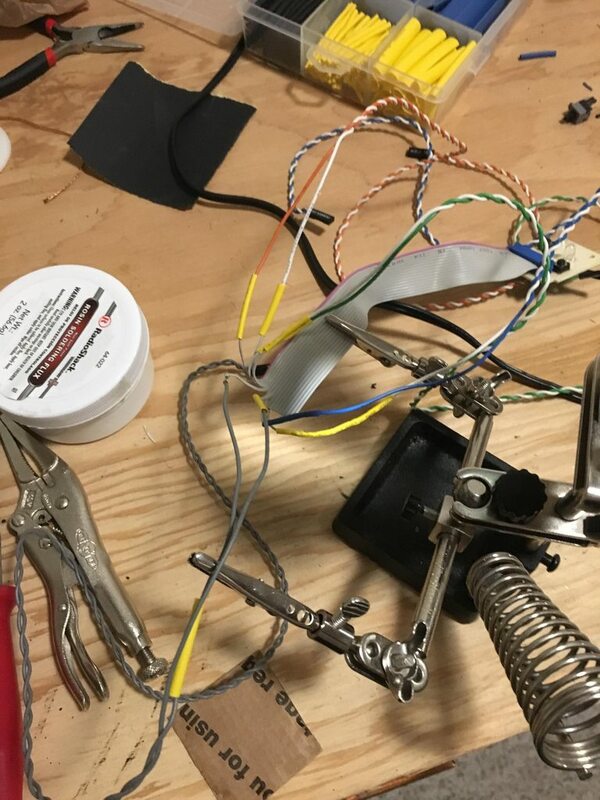 Once I get it up and running with parts that I previously owned as obtained for an ill-conceived troubleshooting plan, parts I've gotten for free or used the barter system to obtain, I'll be revising some of the quick fixes, also once work quites down. If you already haven't amassed a pile of standoffs from old rigs, then you should probably go with 6-32 screws from the back and the old custom-fit Bic pen spacer. 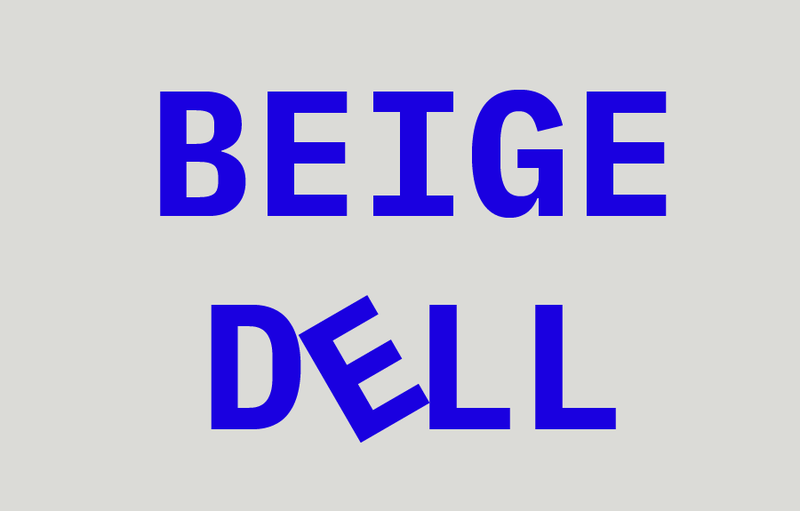 Finding a fit for Dell's flavor-of-the-month stamped risers would be a pain otherwise. Don't be shocked. I'm always here during breakfast. I was mentioning you commenting on the thread as I remember watching your "blooballs" build progress and enjoying the build and commentary. Ha! I popped in here because I remembered you. I didn't realize you had been bittech-afk that long. Honored. I've been around, but out of the case mod section at least. Went to a laptop in school desktop didn't do much. 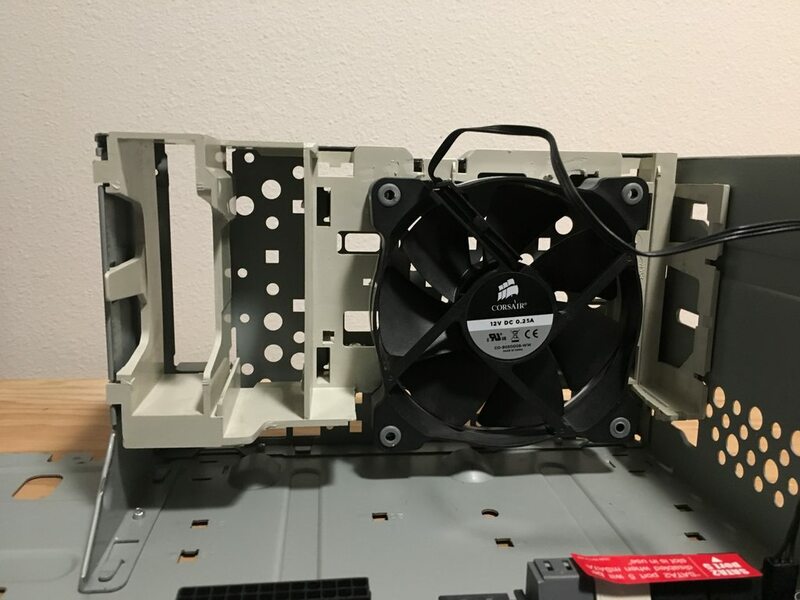 So I managed to get the stock fan enclosure to fit back into it's home by the motherboard I/O panel, so that was excellent. I've now got a 3 pin fan in there to give me actual speed control. I traded for a stock intel HSF since it actually fits and a heatsink is better than no heatsink. There was a bar runnnig across the side panel for rigidity , that interfered with the graphics card power cables, so I removed the bar. Side seems reasonably stable. 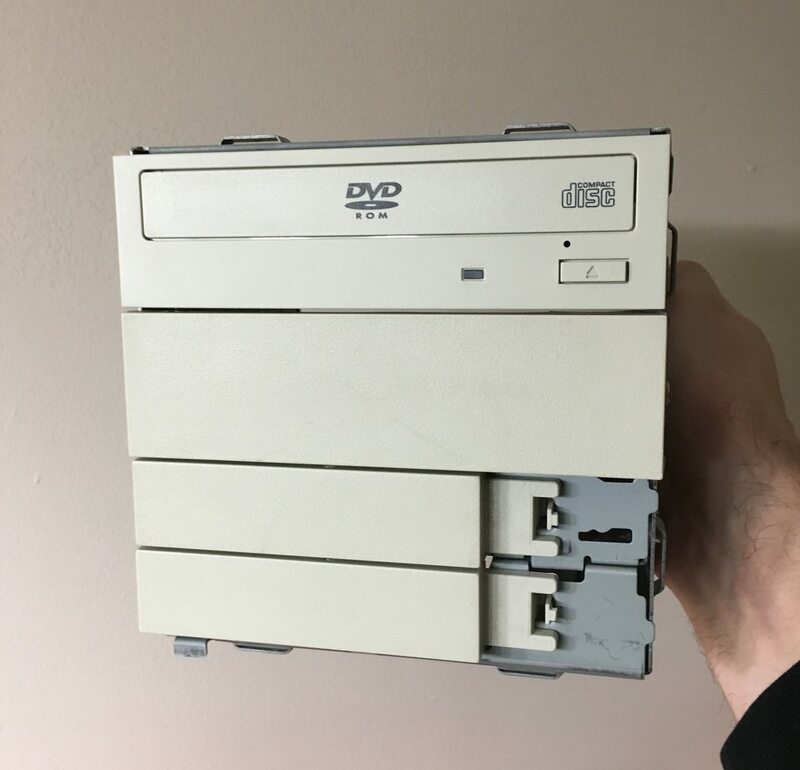 I also acquired a SATA beige DVD-ROM drive. I was surprised to find that combo, but quite happy. The color match is pretty good! Doubt I'll really use it but it's better than a hole in the case. There's the whole front of the case in a well-lit area. I cleaned the case with a Mr. Clean Magic Eraser, got most of the scuffs off the case and really seemed to clean it up. I also got my replacement Intel Inside Pentium sticker, so I was pleased how that came out! The Win XP Pro sticker still on the side of the case, it's part of it's life and I didn't want to remove it, much like the "Eric" on the back. Here's the side of the case, with uncle chester coming round the side. And behind the chair is the Spanish Inquisition. Here's a good picture of how the back turned out. I will be getting a longer more aggressive file to help smooth some of the longer cuts out and make them more uniform. 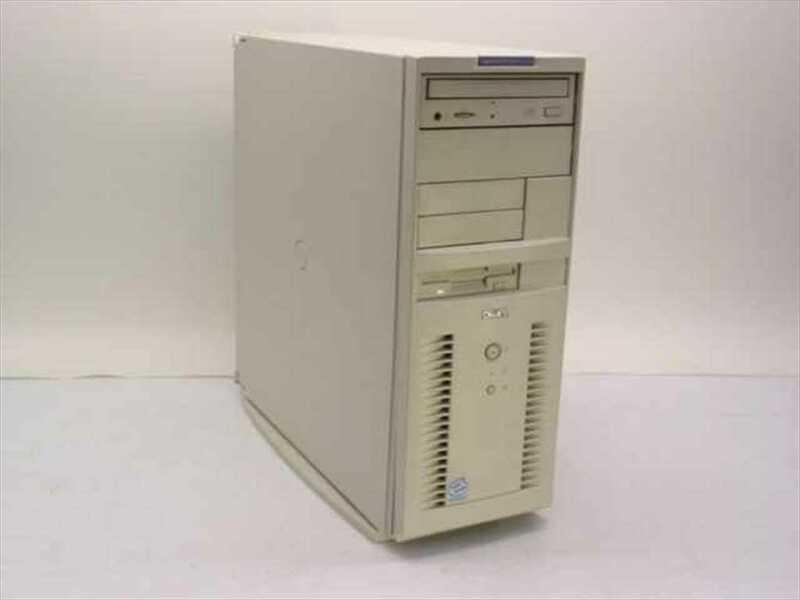 I also tried to get some information from Dell on the original spec of the build, I was told it had a Pentium Pro in it originally, but I couldn't get any information from Dell. Not too surprising since it's from March 20th 1997. And the interior. Parts will be coming out shortly for phase 2 so I didn't care too much about the cable management. Once it's done I can tie things down nicely. It's a pretty tight case but things fit fairly well. the new DVD drive is shorter thankfully, so that gives me some less strained cables. 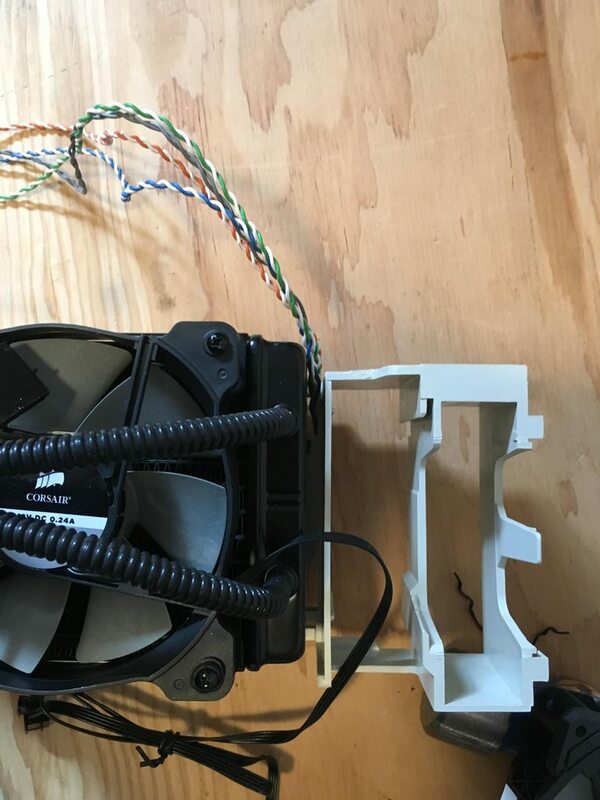 Fit 120mm fan with clearances for AIO to front. This will be the most involved as I'm not sure how I'd like to proceed, keep existing plastic or try to model and 3d print new stuff. 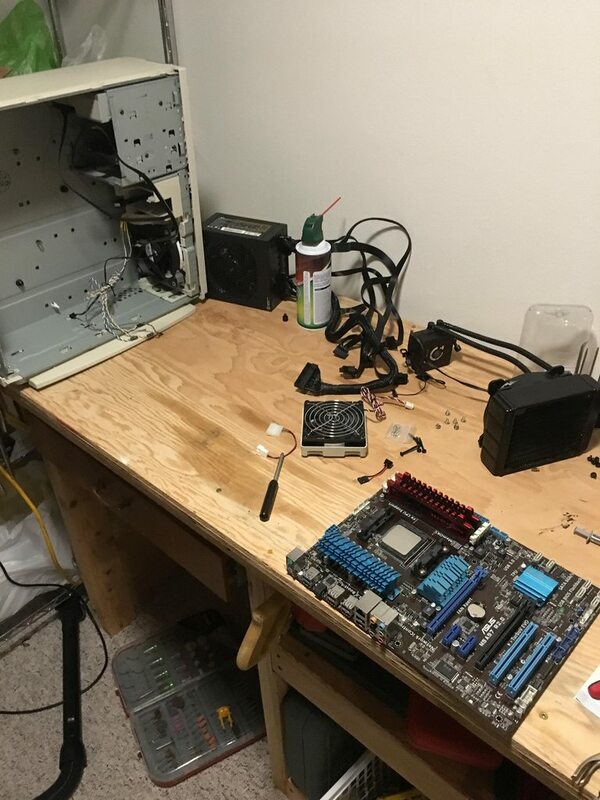 Find some AMD hardware to put in the case for the sake of irony. Clean up case internals once modifications are complete. Shorten the power button cabling so it's not as visible, this will be in conjunction with the 120mm front fan as they vie for the same space. So there a few "new" parts for this build. I acquired a Corsair H80, it'll allow me to figure out sizing for components and if I like it, all the better! I acquired an Asus M5A97 R2 and an AMD FX-6300 with 8GB of G. Skill RAM. 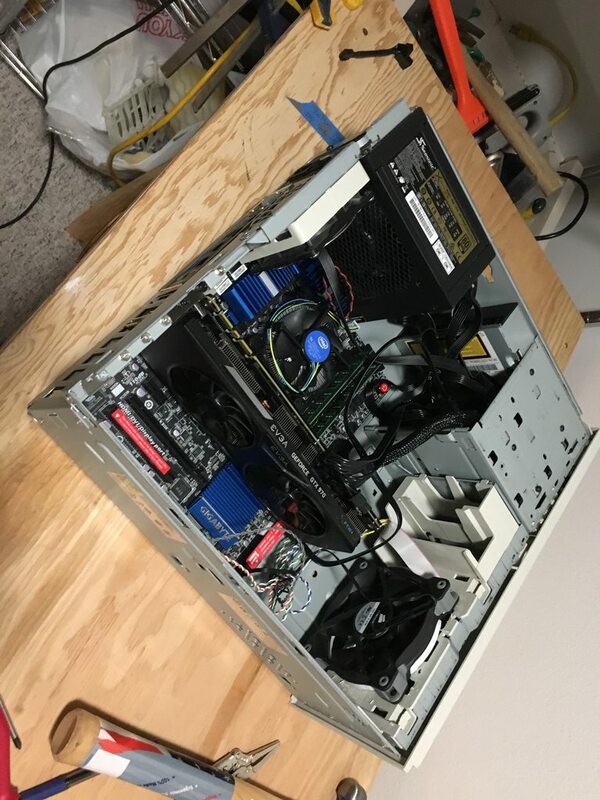 - my existing Z77 smelled of leaking caps and the Celeron G1610 isn't anything to write home about. So I got something relatively weird and the opposite of the Intel sticker on the front and the "Pro" of "Pentium Pro" in the case name. Workbench is "clear", ready to do some stuff! I removed most of the components to file down the I/O panel area a bit more so the panel could mount nicely. When I cut the front of the case up I'll have to remove another tab that's putting pressure on it when the rear fan is in place. It snaps into place much more cleanly now. I originally put the radiator on with the barbs to the interior of the case, that didn't fit, nor did it fit with the barbs going vertically with the existing plastic. Trimmed off the rest of the plastic that I believed to be relatively superfluous at this point. There are a few nibs of plastic that I will remove in the future to improve airflow but this is my proof-of-concept. I've highlighted those in red, but the radiator can easily be mounted now. It fits much more nicely now! After taking some time to analyse how to proceed, I will start with removing the plastic highlighted in red. 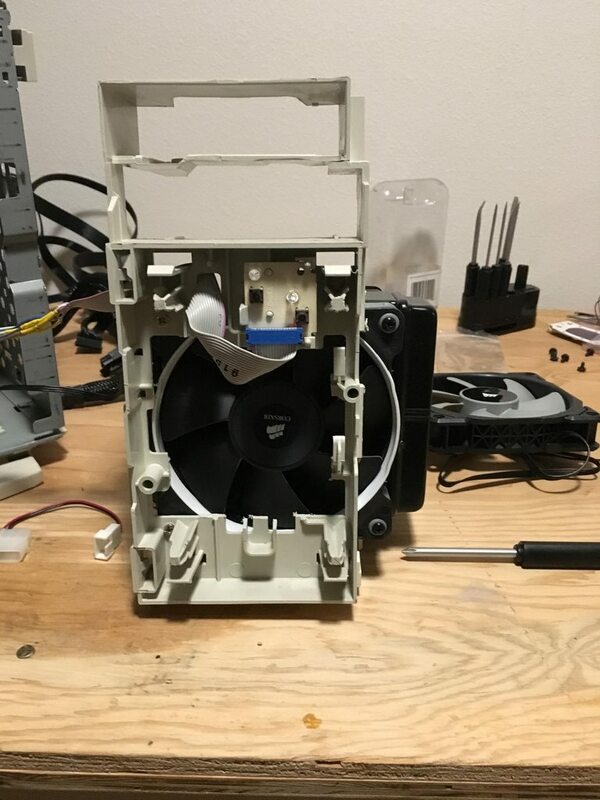 To get the fan to mount to the case, I may epoxy on a 120mm 3D printed plate or laser cut plate and remove that vertical bit going between the top and bottom of the fan. That would restore rigidity to the piece but maximise airflow by not cutting the fan off from airflow as much. 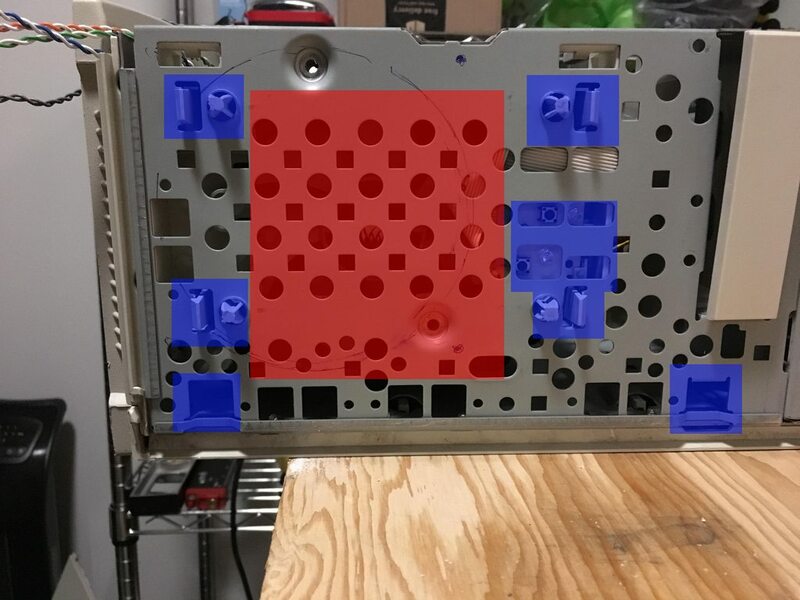 With the front panel of the case, the areas in blue are mounting points for the front panel or the interior plastic panel, these will be kept. So I won't have a perfect airflow to the fan, but it was going to be cut off by the unmodified front panel anyways. The red is an area that I could cut out, but I wanted to leave some area on the side of the case for rigidity. I may affix a grille to the area if I cut out more to restore some connection. AIO is mounted and relatively secure, even though it only has 2 screws going to the plastic panel ,it doesn't flex. Now that I know this isn't a fool's errand I can hem and haw over what to do now...progress! Everything is all back in the case, the AIO tubing was more rigid than I had expected and getting it to mount was a bit of a pain, but it's secure. I am missing a Seasonic PSU to Molex cable (no idea where mine went) so I can't continue with this yet. 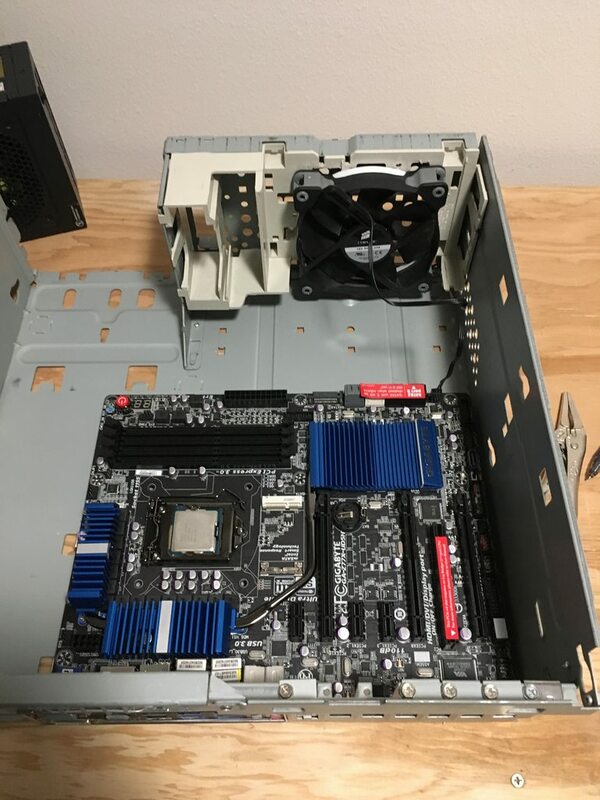 Since these parts are new to me, but not new, I wanted to assemble it and test it out, so it'll all be coming out again but I do know it all fits.Once it's done I'll cable manage to the best of ability patience. If anyone has any ideas on things I should be doing, please let me know. Thanks BT! 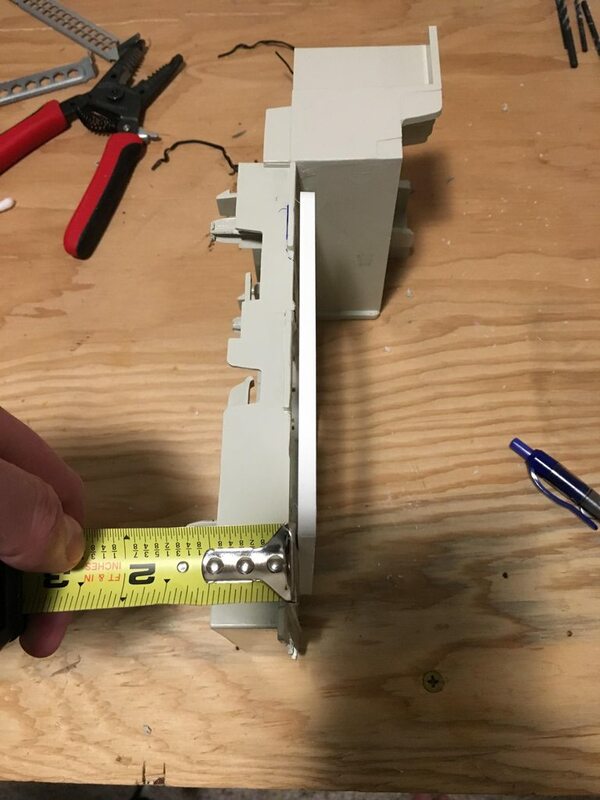 Traditional cable management =Stuffing the extra bits in the 5 1/4" bay. 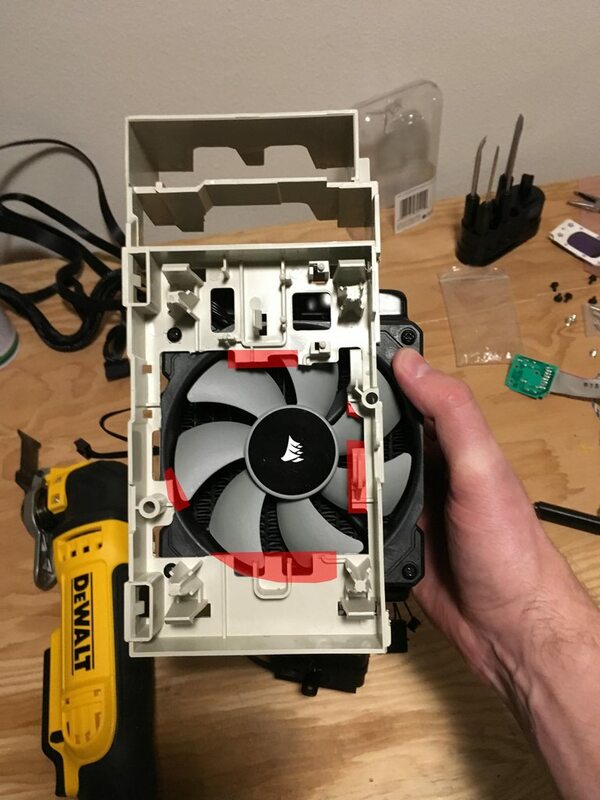 Tradition also tells you to remove the gpu I/O covers for extra airflow. The parts are ABS, one of the easiest plastics to work with. Just fuse some tabs for the fan screws on the side of the bracket with acetone. I've harvested the outer plastic of several of these cases for random plastic repair. My cable management is VERY traditional at this point. Those flat cables do like to unfold though. I was tempted to fill the rest of the I/O slots up with those molex blower fans when looking for matching covers, jury is still out on that. Yeah, I've definitely fixed (in a rather ugly manner) some stuff around the house with acetone and some 3d-printed rafts. I've plastic welded too but that's definitely not a finished look with my skill level. (they're a great plastic graft) I'll see what I can conjur up, I've never emptied the trash from this project lovingly saved all the cutoff plastic so I do have pieces to work with. Hello again BT, not too many pictures, but lots of good planning was done with this update. Removed the front plastic and offered up the 120mm 5mm spacer that will be adhered to the plastic. I may revise the design, as it has been 3d printed, to have better strength vertically. I will keep one screw hole that I have previously drilled in a very tight area on the backside. The other will be filed out a bit to realign the fan/bracket with the case. Currently it's a bit off of plum. About the final position, without the spacer since the screws wouldn't quite work with the plastic bracket and the fan thickness. I'll have to get some 30 or 35mm screws in the right threading. I did clean up the brackets cuts though with a file and some acetone to smooth things over more nicely. I've got a good idea of what to remove that is superfluous and what is necessary. 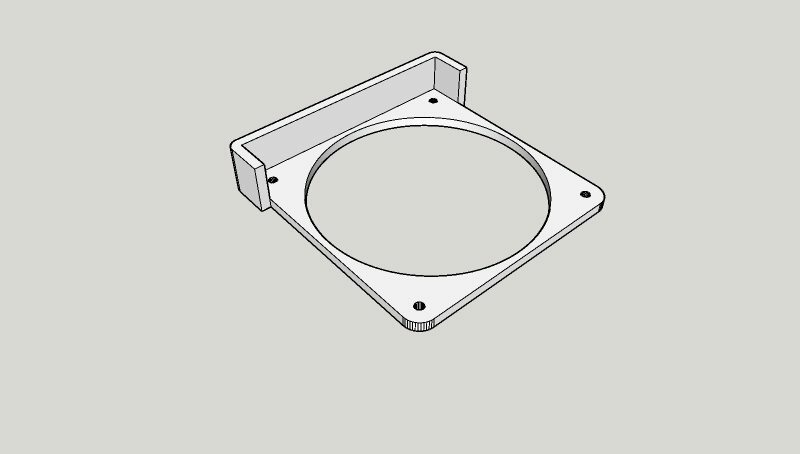 This is a model of the fan spacer with a 20mm high 5mm wide bracket around that I will file to fit within the case and align with the holes that exist currently. Then I can cut out the vertical part of the bracket on that side allowing for much better airflow. Then it'll be some trial and error to get the front panel as open as possible as well. I reapplied thermal paste to the northbridge as well, it was a fibrous thermal pad that was extremely hard. I applied some Arctic Silver 5 after cleaning both surfaces. The northbridge would just smell warm and be too hot to touch, hopefully this helps dissipate heat more efficiently than before. It doesn't help that I have no fan by the CPU blowing onto the motherboard anymore. I may try a third party Northbridge cooler. Subbed, Love watching Beige PCs under go a mod make over. Thanks MNPCTech, from one Minnesotan to another! More finicky things during this update, had a spare hour this evening so I wanted to finalise a the updated bracket design in terms of dimensions. So I filed out the hole on the top left and made it a tad oblong, nothing a washer won't fix as it's just there for compression. But I've been able to adjust the spacers edge to be parallel with the plastic bracket. Now I'm ready to get some final dimensions for the improved plastic spacer which will integrate into the bracket, ideally with some degree of success. Here's the depth of the plastic faceplate. 15/16" deep. in mm that's 23.8, so a depth of 23.5mm should suffice quite nicely. My Sketchup model is in mm since the fan is in mm typically so I'm working in metric for that model. With the spacer loosely in-place, I was able to sketch out what I'd be cutting around. I don't want to make the front too flimsy, so I may adjust those to be further away from some of the mounting points. Thankfully it's already pretty well-ventilated with all of the perforations across the front. Here's how the space will fit within the case, it'll give me a fair bit of room on each side. And Ideally it'll give me some versatility in the future should I get another AIO and need some different clearances. It's fitting a H80 which while it isn't huge, it's not the smallest of radiators. I do have a 25mm fan on top of that bracket too so it's pushing any radiatior chin out almost past the upper part of the plastic bracket. I could trim in the future if I needed but I'll try to minimize cutting to keep things as rigid as possible. 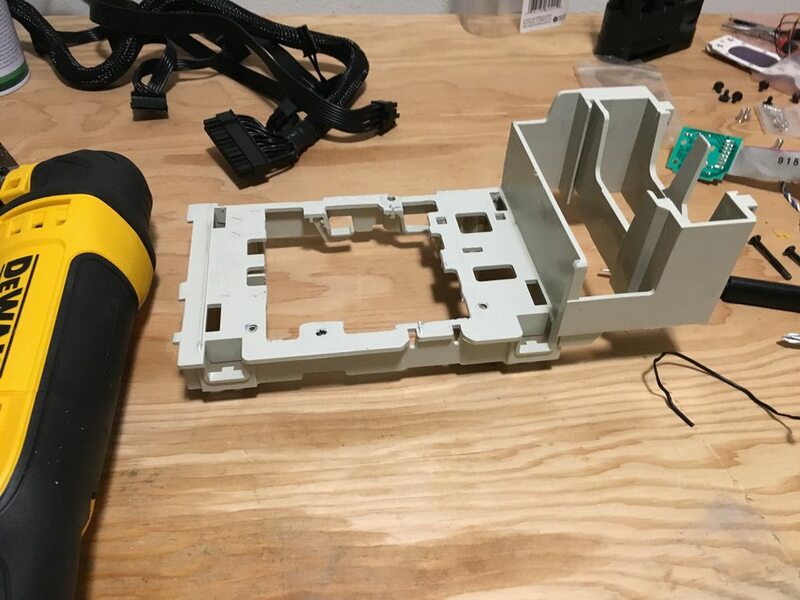 I'll be getting the bracket printed in white PLA, will more than likely adhere with acetone to the existing plastic. 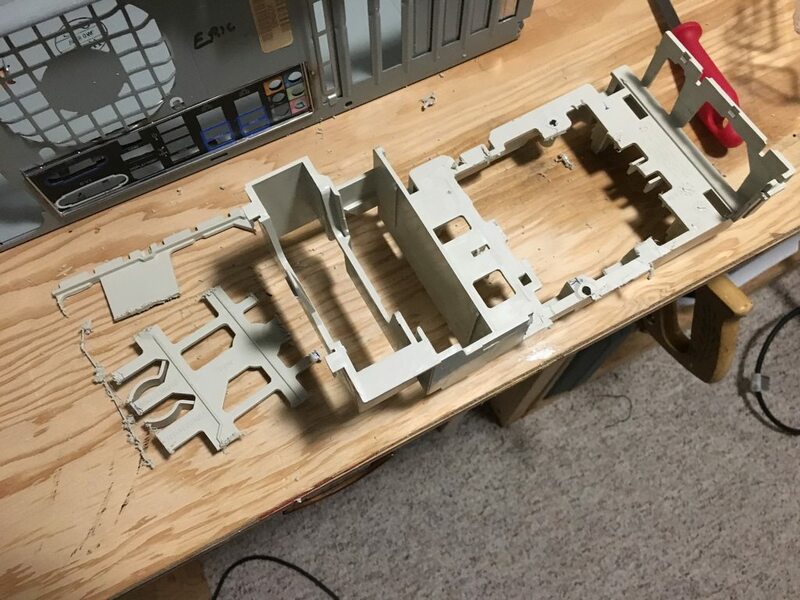 I want to paint the white PLA beige prior to getting the bracket adhered in all visible areas and leaving the area I'll apply acetone clean. This is the last hurdle I have to finalise this concept, now I just have to see it through. I also picked up some craptastic beige speakers, I may just put a new 3.5mm jack on them, or I may get really weird and try to replace all the internals, we'll see. Hope everyone enjoys this and have a great weekend BT! Small update again, but made some good progress. 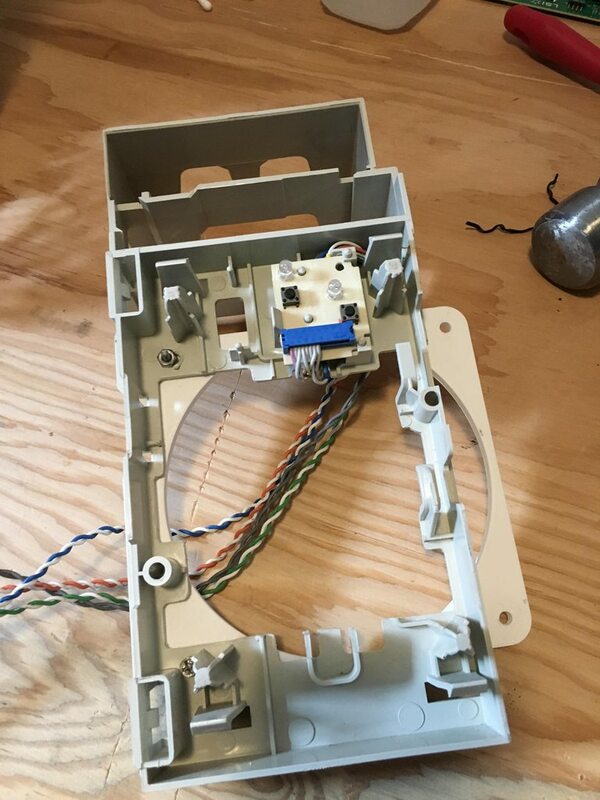 Previously the power/reset button and power/HDD LEDs had been wired to existing cabling as seen in this picture that I had posted previously. That ended up being right in front of some of the fan so I wanted to rectify that. 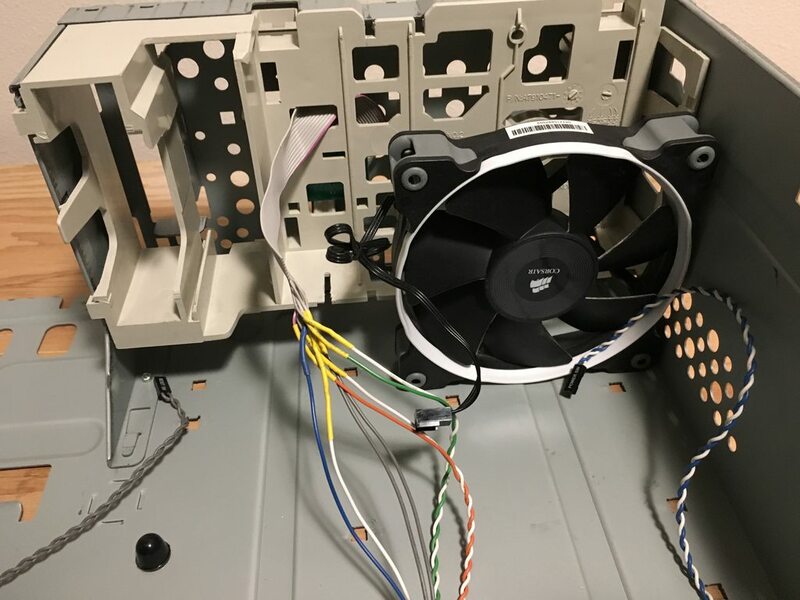 I split the cable to reduce how much would cover the fan, but then decided to really go for it and moved it way up to reduce as much of the rigid slack as possible. 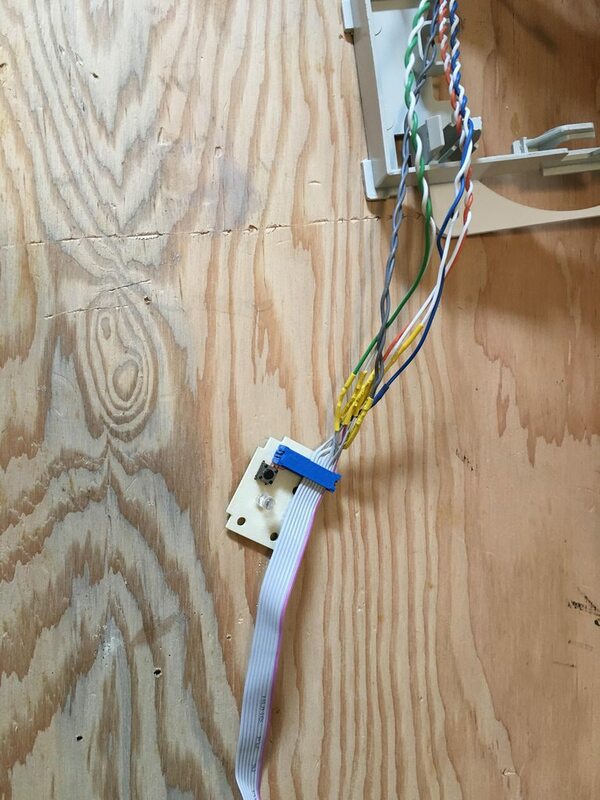 Then remounted the cable much further in so it's really on there to interface with the punchdown connection. I daintly used a hammer and a few tappy tap taps and it was seated. Re-tested all the cabling. Was testing LEDs when I took this photo, everything still lit up properly so the cable was happily reseated. Really could've used a third-hand with this part. Trimmed the cable down, looks a lot cleaner. 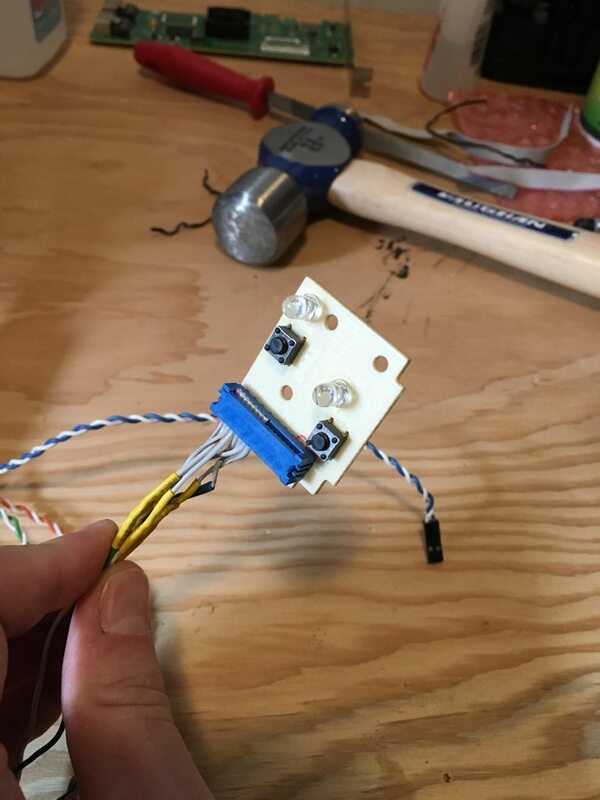 If this doesn't work next step is to solder directly to the board. I'm hoping to avoid that as I don't have a nice way to desolder the existing connection. I rerouted the cables underneath and around so it really doesn't impact airflow or the radiator now. Plus it comes out on the far side of the case, keeps airflow a bit cleaner- that's the hope anyways. I cleaned up a bit more of the backplate removing excess plastic and trying to maximise airflow without compromising rigidity. 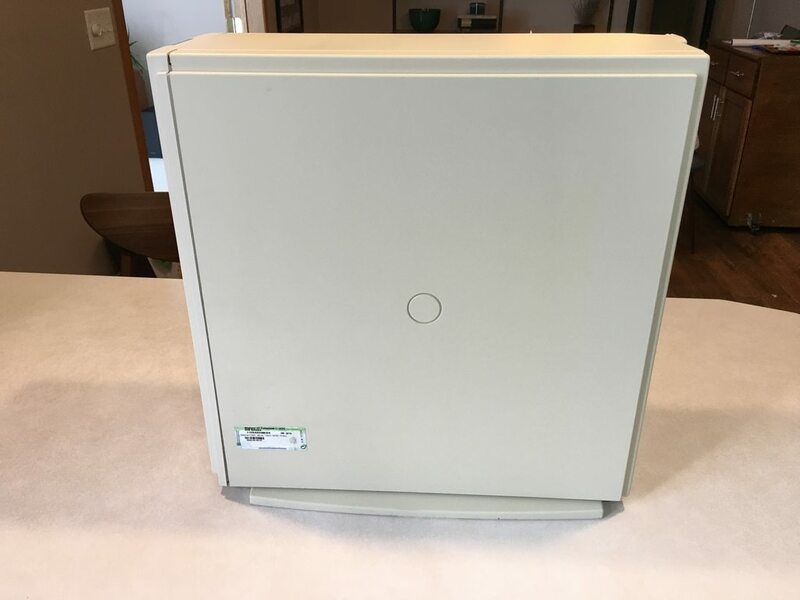 There are some brackets and mounting points on the back of this piece at the top that I need to keep for the power/reset buttons. I erred on the side of caution so they wouldn't move too much when the button was pressed. I polished up some of the scuffs with acetone and tried to make it a bit cleaner. The area in red will be going away once I get the new piece 3d-printed and mounted. This is my excuse as to why that area is a bit rough. I did clean up a few more errant pieces of plastic after this picture was taken.